About Us > NCLR Staff & Board > Adetunji Olude, Esq. 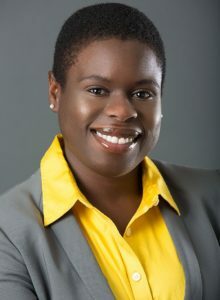 Adetunji Olude is an attorney with the Judicial Council of California’s Center for Judicial Education and Research where she focuses on appellate programs. Before joining the Judicial Council, Adetunji worked at a plaintiff-side employment law firm litigating individual and class/collective actions in employment discrimination, whistleblower retaliation, and wage and hour. Prior to employment law, Adetunji practiced in consumer rights first as a Latham & Watkins, LLP Equal Justice Works Fellow and later as a Staff Attorney at the Housing and Economic Rights Advocates. In 2015 and 2016, Adetunji was selected as a “Rising Star” by the Super Lawyers publication. In 2015, Adetunji was also ranked as one of the Top Women Attorneys in Northern California in San Francisco Magazine. Adetunji earned bachelor’s degrees in Social Welfare and Political Science from the University of California, Berkeley, studied Sociology at the Pontifical Catholic University of Rio de Janeiro and earned her law degree from Georgetown University Law Center where she was a Public Interest Law Scholar. Adetunji lives with her wife and son in Oakland, CA.